People in Cumbria are facing a massive clear-up operation after floods swept across the county, swamping homes and business and cutting transport links. People who had to leave their homes are being warned not to return because more rain is falling. About 100 people are in emergency centres. More than 1,300 homes were hit and many were left without power or mains water. Power was shut down in Cockermouth for two hours on Saturday evening as police carried out searches of the town. Prime Minister Gordon Brown was in the area earlier in the day to see the damage caused. He pledged an extra £1m to help affected areas, after meeting flood victims in Cumbria. He paid tribute to Pc Bill Barker, who died in the floods, and praised rescue teams for their "superb response". 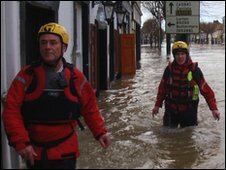 The Environment Agency had four severe flood warnings in place. A number of bridges were swept away and other bridges closed while they are checked. Many roads have been closed across Cumbria. Roads shut include the A593 Broughton in Furness, the A596 Workington Bridge and the A6 Eamont Bridge. Members of the public have been told not to put themselves in danger by using bridges as vantage points. Every member of staff in the Cumbrian police force is now on duty. United Utilities is working to reinstate power, but some substations are still under water. The firm has emphasised that there is no need to boil water from the mains supply before consumption and water across Cumbria remains fit to drink. The firm said people getting water from private supplies such as springs or wells should take care to ensure it has not been affected by flood water and should boil it if in doubt. BT said all ordinary phone lines had now been restored. It was also restoring thousands of broadband services. "People go through a change of emotions, from despair to acceptance. Having the prime minister here lifted people's spirits. He was warmly received." In Cockermouth, one of the worst affected places, police are checking properties to ensure everyone is safe. Council workers, police, firefighters, RNLI volunteers and paramedics were stationed in car parks as the town began the clear-up. Mud and debris were clogging the town's streets. Local MP Tony Cunningham said some people might have to wait months before they could go home, but he praised their resilience. "There are many broken buildings in Cockermouth, but the people are not broken, he said." Liz Campbell, owns the Shepherds Hotel in Cockermouth which is known locally as the Sheep and Wool. It is acting as an evacuation centre for victims of the floods. She said people had "mixed spirits" but the centre had enough clothes, food, games and magazines. She said: "People go through a change of emotions, from despair to acceptance. Having the prime minister here lifted people's spirits. He was warmly received." The centre has received an abundance of sleeping bags and clothes from donors. It also has a list of people offering to help. Mrs Campbell added: "Everyone is being well looked after. We have plenty of food, good access and power." Some families moved to hotels after their homes were affected. Joe and Shelley Doyle had to leave their home in Cockermouth with their three young children. Mr Doyle said: "The police came knocking at the door saying they were going to evacuate the street. "The water was going down in between our houses and a block of flats. It was quite fast." The family have been told they might not be able to return to their home for four months. Mrs Doyle said she was finding it "hard and very emotional". In Ulverston, the clean-up operation has been ongoing after 80 houses were flooded in and around North Lonsdale Road. Jennifer Atkinson runs Ulverston Health Club in North Lonsdale Road. She said: "We have had to call in everybody that has got two arms to give us a hand and move some very heavy equipment and very heavy dumb bells, rip all the carpet up and hopefully get rid of the sewerage, so we can open Monday." Cumbria County Council has pledged £50,000 to the Cumbria Flood Recovery Fund to help communities recover from for the severe floods. Councillor Jim Buchanan, leader of the county council, said: "We will recover from this terrible situation and the county council will make sure that all agencies are in this for the long haul. "We've got to make sure that Cumbria's infrastructure is back up and running. The floods have passed, but the recovery will take months and years." 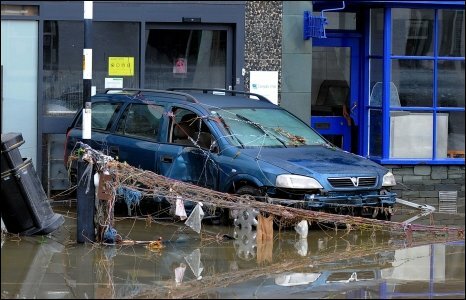 Pictures from Prince Charles' visit to the county after the floods.